On these grounds in 1939, Henry Ford built a school to serve the educational needs of the African-American children of lower Bryan County. Professor Herman Cooper was appointed as the Principal when the school opened later that year, originally with grades one through six. 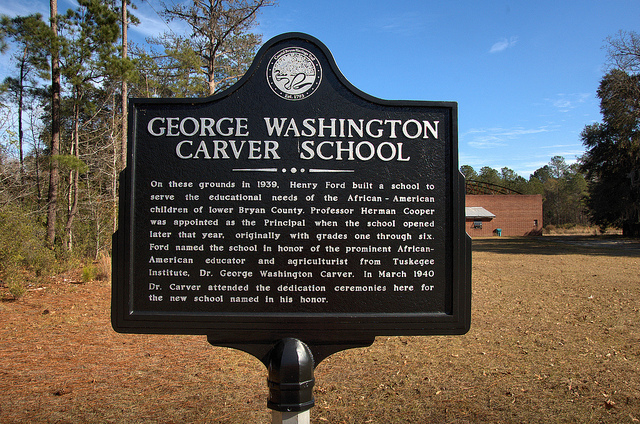 Ford named the school in honor of the prominent African-American educator and agriculturist from Tuskegee Institute, Dr. George Washington Carver. In March 1940 Dr. Carver attended the dedication ceremonies here for the new school named in his honor. The shell of a gymnasium is located at the back of the property, but I’m unsure if it was a later addition to the school, or part of the Bryan Neck Missionary Baptist Church, located next door. Thank you for this blog post. I have been trying to find information on this old school for a while. My mom and her siblings attended this school. The gymnasium you mentioned was a later addition to the school.